AdipoLean offers WellTrim® iG (IGOB13®), a unique patented extract ofIrvingia gabonensis, combined with Oligonol®, a lychee and green tea complex containing low molecular weight polyphenols for enhanced efficacy. WellTrim® targets adipogenesis via pathways involving PPAR gamma, leptin, adiponectin and glycerol-3-phosphate dehydrogenase. In a 10-week, randomized, double-blind study involving 102 overweight subjects, supplementation with 300 mg IGOB131®, in divided doses, promoted an average weight loss of 28 pounds compared to 2.9 pounds in the placebo group (p<0.01), supporting healthy lean mass ratio and abdominal circumference. In addition, WellTrim® maintained healthy lipid and triglyceride metabolism to support cholesterol levels that are already within the normal range. The mechanisms of action for Oligonol® include support for healthy insulin function, adiponectin synthesis and lipolysis. In a double-blind, placebo-controlled study involving 19 individuals, Oligonol® supported healthy visceral fat composition. 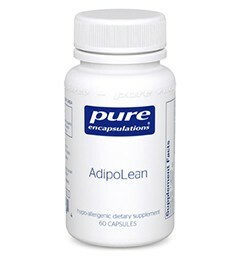 AdipoLean supports healthy adipocyte function for weight management† and healthy visceral fat composition. IGOB131® is a trademark of Gateway Health Alliance, Inc. and is protected under U.S. Patent 7,537,790. Oligonol® proprietary blend of lychee (litchi chinensis) extract (fruit) and green tea (camellia sinensis) extract (leaf)50 mg.
ascorbyl palmitate (fat-soluble vitamin C)5 mg.
2 capsules daily, in divided doses, 30 minutes before meals. 49 points will be rewarded to you when you buy this item. Earn free products. Click on the green "i" for more information on our rewards program.